InLoox PM 8 saves storage space and avoids duplicate records simultaneously. As the software works with file and object links, documents are not saved in Microsoft Outlook and Exchange Server. Click the arrow on the button to open the context menu. Select File, Internet link or File link to link to you local data. By choosing File click and choose a document you want from the Open dialog box. The document will then be displayed in the Document list on the Documents page. In the Path box enter a path or an internet link. In the Status field enter instructions, e.g. complete or awaiting release. In the Notes field enter comments and remarks to the document. Choose between Planning, Time Tracking or Mind Map items and Work packages from the Assign Document Relation dialog box. InLoox PM displays a document as a paper clip on the page you have chosen. You can also open the document on this page. You can open the chosen page. Click link on the Links area. If you want to delete the item , click Delete symbol . 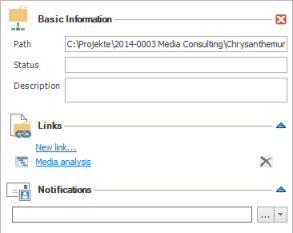 All added resources receive automatically notifications about new, edit or deleted documents. In the area Notifications, you can inform other resources, e.g. project planner, about assigned work packages and about the changes in them. The email notification set by default. Add the document via Drag and Drop to the document list or to the other folder in the folder view left. You can also add the documents from Outlook to the InLoox PM planning via this function. For more information see Add Outlook elements to InLoox PM. How to add and edit project documents | InLoox PM 8 • Copyright 1999-2019 © InLoox GmbH. Tous droits réservés.